Stock Up On NECCO Products! NECCO Wafers: Usually when you hear the word NECCO, you think of these wafers first. These candy discs are a popular staple of nostalgic candy fans, so much so that other flavors have been made for them to enjoy. Grab a box or two of classic flavors, or try the chocolate or tropical flavors to compare. Peanut Butter Kisses: If you love pure peanut butter, you have to get a bag or two of the Mary Jane Peanut Butter Kisses. Made with real peanut butter, this chewy treat has been a fan favorite for peanut butter lovers for years. Grab either a 15oz bag or a 30lb box to stock up. Sweetheart Conversation Hearts: Can’t imagine Valentine’s without Conversation Hearts? Then you should grab a bag or box of these iconic holiday candy. Get either the classic flavors or the sour ones and make sure you share with someone you love! Sky Bar: These fly high in popularity! Each bar is made up of four, distinct chocolate squares filled with peanut, vanilla, fudge, or caramel. Our bulk box has 24 bars inside, so there’s plenty to portion out whenever you want a Sky Bar. 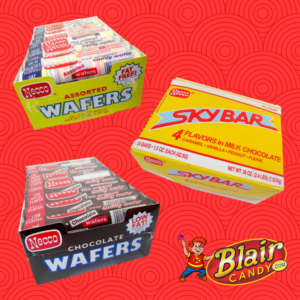 These are just a few of NECCO’s famous treats, but we have more at BlairCandy.com! Shop these boxes of candy in bulk now to stock up in the event that NECCO’s doors unfortunately close. 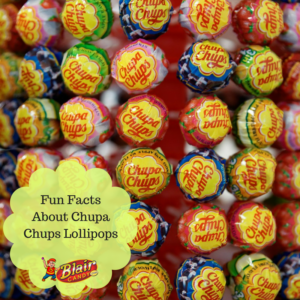 Did You Know These Facts About Chupa Chups? -Chupa Chups share the same birth year (1957) as many major stars: Madonna, Prince, The Smurfs, and Michael Jackson! -They weren’t always called Chupa Chups. Originally, they were called GOL, then CHUPS, before a jingle gave them the final name, Chupa Chups. -Only seven flavors were released when the lollipops hit candy stands. Strawberry, Orange, Lemon, Strawberry & Cream, Chocolate & Vanilla, Coffee & Cream, and Mint were the first flavors. Now, fans of Chupa Chups can find over 100 flavors! -Famous artist Salvador Dali created the iconic logo. He made a simple sketch on the back of a newspaper! -Chupa Chups were brought into space in 1994 and then had a species of sea sponge named after them in 1999. 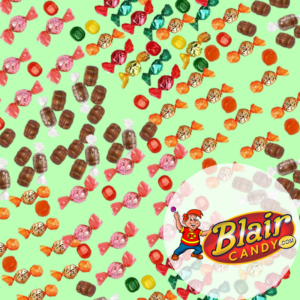 Enjoy plenty of Chupa Chups lollipops in bulk today by visiting us at BlairCandy.com! It’s Almost National Peanut Butter Lover’s Day! Reese’s Candy: This is a given for National Peanut Butter Lover’s Day! We have tons of Reese’s treats for you to enjoy. Snack on a classic peanut butter cup or a handful of Reese’s Pieces! You can even celebrate early with these Reese’s Eggs. 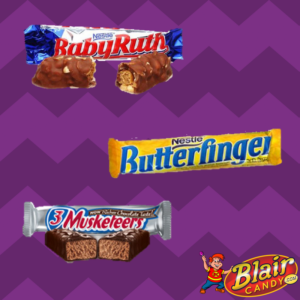 Butterfinger: Bart Simpson once said, “Nobody better lay a finger on my Butterfinger!” With Blair Candy’s selection, you should be able to have plenty of Butterfingers to enjoy and share. Have a candy bar or get a bag of chopped Butterfinger topping and add to your desserts for the holiday. PayDay: Salty, sweet, and chewy, these candy bars are a real delight! Each bar is covered in peanuts with a caramel center. While this isn’t necessarily a peanut butter based bar, we still think you can celebrate Peanut Butter Day with it. 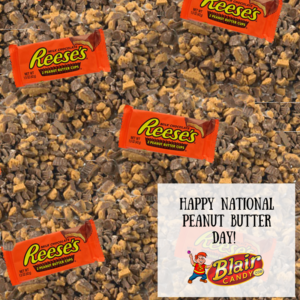 What will you celebrate National Peanut Butter Lover’s Day with? Find these and other peanut butter treats at BlairCandy.com today! Gummy Sea Critters: How cool are these! Each box has 60 sea creatures in fun fruit flavors and are super colorful. Choose from turtles, seahorses, crabs, and octopi! Classic Bears: What’s better than a gummy bear? Each of these bears is flavored with the traditional, gummy bear fruit flavors. These aren’t sour, so if you need the sour gummy candy fix, check out these gummy worms! Strawberry Puffs: If you love strawberry gummies, then you have to try this bag of Strawberry Puffs. Each bag has a puffy, marshmallow-like strawberry. They melt in your mouth and are packed with flavor! Try these and other new gluten free gummy candy at BlairCandy.com! There, you’ll find all of the new and classic treats you love that are also gluten free. First, they feature all of the berry flavors you love when enjoying an Airheads Taffy. While this flavor is called “rainbow berry” you can taste hints of strawberry, blueberry, and raspberry in every bite. Also, each piece has sour sugar twist because of the sugar sprinkled on the candy. Second, there’s plenty of ways you can enjoy this candy. If you just want to try it, consider this peg bag. It has 6oz of candy ready for you to enjoy. Want more? Then you’ll want one of two boxes. One box has 18 individually wrapped portions of bite-sized candy, great for on the go. The other, has full candy belts, not bite-sized pieces if you really love this candy! So what are you waiting for? Try these new Airheads XTreme Bites today for a sweet and sour treat! For the gummy candy lovers, Trolli has made new Sour Brite Octopus candy! With all of the sour gummy taste you love, these loveable octopi will make a sweet snack. If you plan on celebrating National Candy Day with gum, might we suggest a pack of AirHeads Gum? If you love their Blue Raspberry or Cherry flavors, then you definitely need to try this gum. 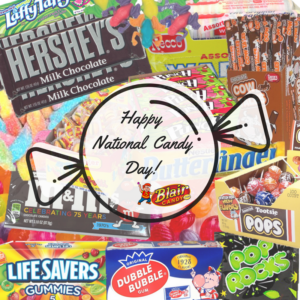 Classic candy lovers, we know exactly what you’ll love to enjoy for National Candy Day. This Pez Retro Tin has multiple packs of flavored Pez refills and a classic dispenser. Finally, chocolate lovers have to try this new chocolate bar. The Animal Bar is popular in the UK and features different animal shapes in its milk chocolate bar. Don’t wait! 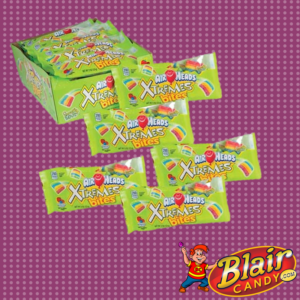 Celebrate National Candy Day with these and other new candy in bulk boxes on BlairCandy.com! 3 Musketeers – This candy used to have three flavors in it, giving it its name. However, it’s now just focused on a fluffy chocolate center and a rich chocolate coating. It’s a great candy for those who don’t like nuts or extra chewy candies. Baby Ruth – Caramel, peanuts, nougat, and creamy chocolate…who could resist! These gluten free candy bars make it easy to indulge and still stick to dietary restrictions. Butterfinger – If you especially love peanut butter, than Butterfingers have been your go-to candy for years. Thankfully enough, these make the gluten free cut, so you can still enjoy this crispy, crunchy, chocolate coated treat. Pick up these and other gluten free candy treats at BlairCandy.com. You can also find some vegan and sugar free candies too. 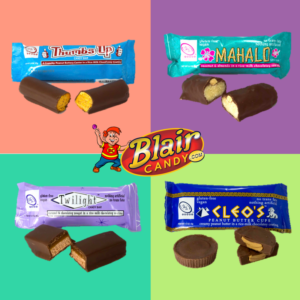 Blair Candy has a wide selection of candy and snack foods so that everyone can have something great to snack on! Wholesale Sugar Free Candy We Love! Go Lightly Sugar Free Root Beer Barrels: Not only are these candies shaped like little barrels, but they have the fantastic root beer taste of an ice cold soda. Sugar Free Gum Balls: Who doesn’t love a good piece of bubble gum? Have a colorful piece on hand whenever you want with a bulk buy. Bonus points if you have your own gumball machine. Black Licorice Gummy Bears: If you love black licorice, then this sugar free candy is for you. All of the licorice flavor you love in a cute little gummy bear! 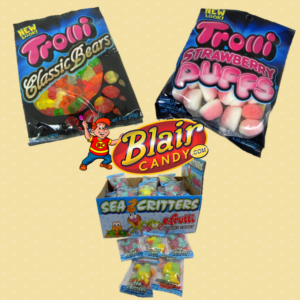 See all of our sugar free candy at BlairCandy.com. There you’ll find these and other sugar free treats at prices for any budget. 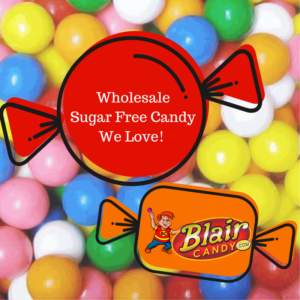 Don’t forget that we have wholesale sugar free candy too! Shop today and find all of your guilt free favorites. Have You Tried GoLightly Sugar Free Candy Yet? Why does sugar free candy get a bad reputation? Usually because people write it off as soon as they hear “sugar free.” While we agree that not all sugar free candies are created equal, the GoLightly sugar free candy has changed the game. They have plenty of flavors that even the pickiest of candy lovers will enjoy. Choose from hard or chewy candy in a variety of flavors! They have classic flavors like fruit flavors, cinnamon, and butterscotch that belong in every candy dish. Also, GoLightly has a few off the wall flavors, like their sugar free root beer barrels. No matter which flavor, type of candy, or even who you share them with, you’ll enjoy the candy you love without the sugar. Try all of the GoLightly sugar free candy flavors, in regular or bulk sizes, today at BlairCandy.com.